The DH series fire door holders are constructed of the finest materials and workmanship available. 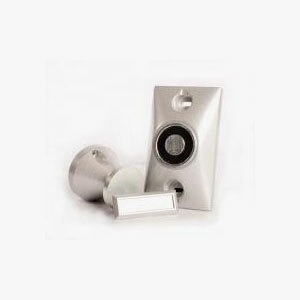 The door holder is made of durable die-cast metal finished in high impact powder coat finish. Other features include standard dual voltage dc or ac inputs of 12 & 24V, 24 & 120V and 24 & 220V models. While reducing stocking requirements, the DH-24120 draws a mere .020 mA @ 24VDC lowering overall job costs (in large installations the cost savings can be substantial).